59 pages | 62 Color Illus. Complete with color pictures from real quick changeover implementations, The Quick Changeover Playbook provides detailed step-by-step guidelines on how to reduce setup times as well as improve flexibility, product quality, and visual control while reducing lead times and costs. 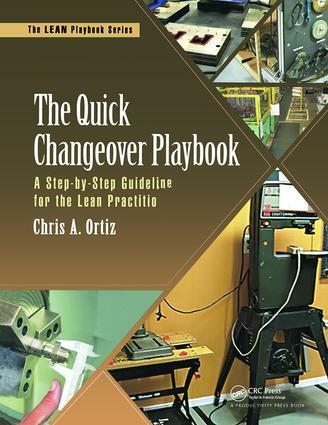 This new book in The LEAN Playbook Series is your guide to effective setup-reduction projects. It is ideal for Lean practitioners and facilitators seeking a training tool and a guideline that can be used in the work area while improvements are being made. Like a football coach, you can use this playbook for quick reference to convey what’s needed to facilitate quick changeovers. If for some reason you forget a "play" during the implementation, you can easily reference the playbook. You can follow page by page, or you can go directly to certain topics and use it to help you implement that particular "play." In addition to color pictures from quick changeover implementations, a combination of short paragraphs and bulleted descriptions walk you through how to effectively reduce setup times on equipment. Wasting little time on high-level theory, the book includes an introductory section dedicated to the 8 Wastes and Lean metrics to provide you with the foundation required to fully benefit from this playbook. The book covers the key concepts you must understand to reduce setup times, including the four steps of a setup, data collection, internal and external work, one-turn methods, intermediate tooling, and standard work. Looking for supplemental information or Lean coaching from Chris Ortiz? Go to www.leanplaybooks.com to receive ongoing support and advice on how to use The LEAN Playbook Series for training and implementation. Chris Ortiz is the founder of Kaizen Assembly, a Lean manufacturing training and implementation firm in Bellingham, Washington. Chris has been featured on CNN Headline News on Inside Business with Fred Thompson. He is the author of multiple books on Lean manufacturing. Chris Ortiz is a frequent presenter and keynote speaker at conferences around North America. He has also been interviewed on KGMI radio and the American Innovator and has written numerous articles on Lean manufacturing and business improvement for various regional and national publications. Kaizen Assembly’s clients include industry leaders in aerospace, composites, processing, automotive, rope-manufacturing, restoration equipment, food-processing, and fish-processing industries. Chris Ortiz is considered an expert in the field in Lean manufacturing implementation and has over 15 years of experience in his field of expertise.